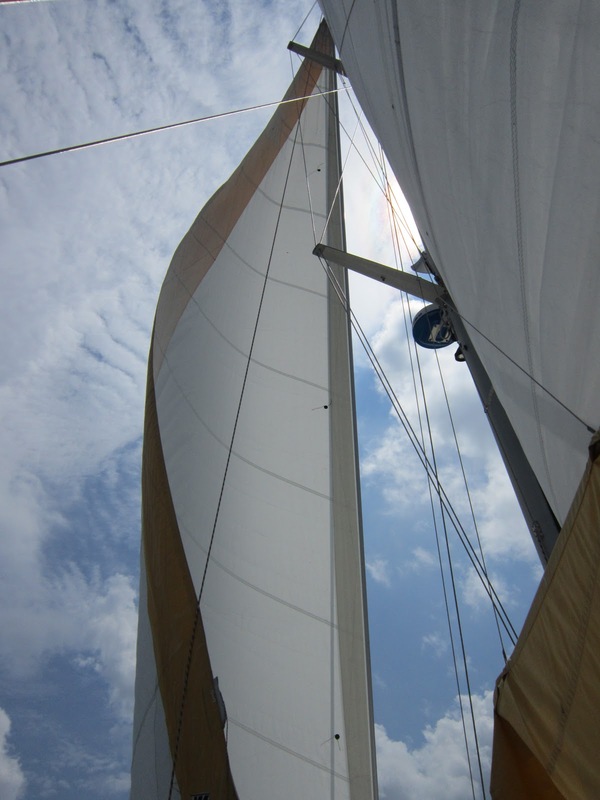 After 10 months living on the ‘high-n-dry’ – Cat Maudy takes to the southern Chesapeake Bay with 2 days of sailing winds – leftover remnants from Hurricane Issac. Cat Maudy and her Captains worked out the kinks on day ‘one’ with 10-15 knot winds…. Hmmm…tacking, furling, unfurling, maneuvering the daggerboard…so many details have gotten rusty. And if sailing wasn’t enough of a moment to be savored, we had the good fortune of being surrounded by sea creatures. A school of dolphins gave us a front row private viewing of Sea World. By day ‘two’ – the winds had picked up to just under 30 knots. It took all my strength to hoist the main….and we’re feeling seriously AARP trimming these bloody sails in heavy winds. It was all worth it in the end. With a reefed main and reefed jib – Cat Maudy rose to the occasion, reached speeds in double digits, and we went along for the ride.